Once a month, feat. Alex Laurie and ski sunday theme tunes. Confusing mix of public- and policeforce-use in this article. But nonetheless, public-facing crime maps are a good idea. Side effects of measurement cultures in election seasons: statwars. Presumably lockouts and safeguard have no more capacity in the affected regions. Short of changing sentencing policy (and the Home Sec has minimal short-term power to do that), this is the only possible outcome unfortunately. Rather handsome Hungarian Vizla, now 17mo old, who strutted about the pub on Sunday as if he owned the place. That he's forced his fathers to write a blog about him comes as little surprise. "Here's something four-year-olds know: A screen that ships without a mouse ships broken. [...] Media that's targeted at you but doesn't include you may not be worth sitting still for." Inflatable that's parasitical to a host building's services. "A collaborative story 130 characters at a time"
"Twittories are stories composed 140 characters at a time by a diverse group of collaborators using Twitter to submit their entry." Each "tweet" (god how I hate that term) is a 140-char fiction. What Paint Did Pollock Use? "stands for Bug And Enhancement Tracking LanguagE. It is an ontology that describes the information kept in BugDatabases such as Bugzilla, Jira and others do [...] format for bug databases to exchange their bug data"
"possibly, the book as we know it might well turn out to have been a contingent historical phenomenon [...] that lasted only half a millennium [...] Conversations between bloggers last hours or days, but conversations between books can last for centuries"
New OGC brand hints at a lot of, erm, "hand-waving". On 1 Jan 1981 "I received a phone call that my beloved grandfather was dying. I began a letter for him that later became my first novel, The House of The Spirits. It was such a lucky book from the very beginning, that I kept that lucky date to start." "define convergence as the tendency of technologies, as they grow in complexity and scope, to overlap (and consolidate) functions [...] trend wherein devices and functions take on commonly shared traits [rather than] a single multifunctional mega-device"
"I was the next animator on Ollie’s desk the following Monday [...] used for decades to create so many indelible animated moments [...] I noticed the pencil sharpener was full of shavings. Instead of throwing them out I poured them into a glass jar"
"A Design System for Interactive Fiction Based on Natural Language"
"Make requests in public for UK government information"
GMP has a facebook app with police news and appeals. Bravo. And is being downplayed by the Home Office unsurprisingly. Not good. The problems of pathological measurement cultures. "OpenStreetMap now has an ‘Export’ tab, joining ‘View’ and ‘Edit’ at the top of the screen. It gives you an instant way to get the map data in a format you want." The stabby backstory of a game. Michael Bywater has a point. "nothing happening forever [...] Semiotic parasites designed to prey upon hypnagogic drift. Weapons against the city's intelligence. Almost no-one reads books any more." Trailer Park Boys is funny. Knowhatimsayin? Very nice spidery drawings, photos of ruins. "extra 300 police will be moved into fighting terrorism and radicalisation within communities [...] Ms Smith is expected to say new jobs will include working with communities and existing police, complementing the work of neighbourhood teams"
Perceptions of criminality: "immigration from eastern Europe has been different to previous arrivals, because it happened much more quickly"
Nice approach on re-rendering content appropriately and meaningfully. On urgency, deadlines, measurement, and controversial. sweetness on Flickr - Photo Sharing! "Google's Android platform is designed to drive fragmentation of mobile operating systems, creating an industry in which Google's cross-platform applications will thrive" says Qualcomm. Support for 42-day detention wavering. How to talk plausibly when confidentiality means all you have to offer publicly is 'trust me'? How to talk about secrets? Jacqui Smith: "We now face a threat level that is severe. It's not getting any less, it's actually growing"
"plea-bargaining would mean that [the 28/42-day detention limit] would be unnecessary [...] adding that he had "no problem" with the US limit of two days" FBI boss prefers contractual plea-bargaining. Hmm, what evidence of misdirection in plea-bargaining? Good example of the red tape vs accountability challenge: "Britain’s surveillance watchdog is blocking proposals by senior police officers to cut through the red tape involved in mounting operations to observe suspected criminals"
"a little ten by twelve bathroom where about ten of us crowded in. Several stood in the bathtub, Reagan was on the throne. I was agitated, I was worried about the idea of giving up all nuclear weapons." "primary contractor for the APLS and will design the system, install it and roll it out across the Metropolitan Police Service by March July 2008. [...] work with Frequentis, a specialist in communication and information systems for safety-critical areas"
"To differentiate an emergency alert from other messages, a unique audio signature or vibration cadence will be broadcast along with the message." Reason for first-responder telcos like Rivada to start looking at publicly-facing services. 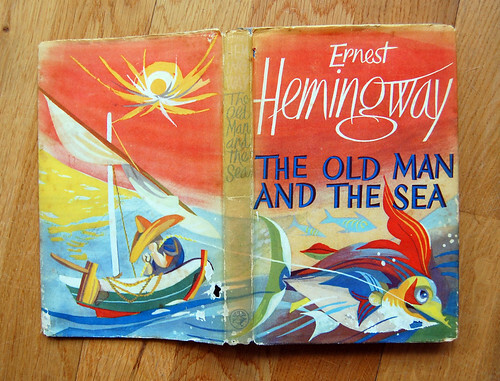 This is Hemingway's The Old Man and the Sea (1952) a short novel of an old, down-on-his luck Cuban fisherman twinned with the monstrous fish at the end of his line, battling him for three days. At the exact moment that the fish took the hook and dived, the line racing through his hands, burning cuts into his palms, the doors slammed shut at Oxford Circus, shocking me on my commute. The old man's struggle is lengthy: the line, his back and hands, a bottle of water, some strips of fish for sustenance, endurance, a direct dialogue with the fish. It's appealingly simple, poetic, of course. The comparison to modern Caribbean game fishing is jarring. "No good book has ever been written that has in it symbols arrived at beforehand and stuck in [...] That kind of symbol sticks out like raisins in raisin bread. Raisin bread is all right, but plain bread is better [...] I tried to make a real old man, a real boy, a real sea and a real fish and real sharks. But if I made them good and true enough they would mean many things. The hardest thing is to make something really true and sometimes truer than true." This particular book is the 1958 Jonathan Cape hardback, and its gorgeous cover is a bit torn and tatty, like the old man's neck and shirt. The uncredited artist has taken a bit of licence with the fish, fattening and colouring it up, but what a cover though. It was owned and studied by my mum at school or college in Melbourne. On the page facing the endpaper inside, there's a price, 9/6, and she had careful pencilled "Merle Murray". Beneath that, in a neatly spaced list, she's written "Theme, Setting, Personalities, Style." On page 71 I found a beige animal hair that must have come from Woosel the cat. She has underlined sections on the physical effort, the passage of time, the arrival of the sharks, the physicality of the man and fish, the geography, and his dialogue with his adversary. There's the occasional note, "second evening", "barbed fishing spear" glossing the word gaff. I wonder what she thought of the book. I remember reading this as a child and being transfixed by the old man's stakhanovite suffering. Having eventually prevailed over the fish, it seems inevitable that he should lose it to the sharks on the long slog back into Havana.